Click here to go to party game ideas. So, let’s talk about SuperBowl snacks that your kids will actually eat, are easy for them to make, and don’t break your budget. Let’s face it… there will be plenty of cupcakes and brownies , so let’s make something fun and different. Here are three recipes to make with your kids for SuperBowl Sunday. This recipe from Delish is really fun and easy for kids to make. It just takes some pre-made crescent rolls and hot dogs. 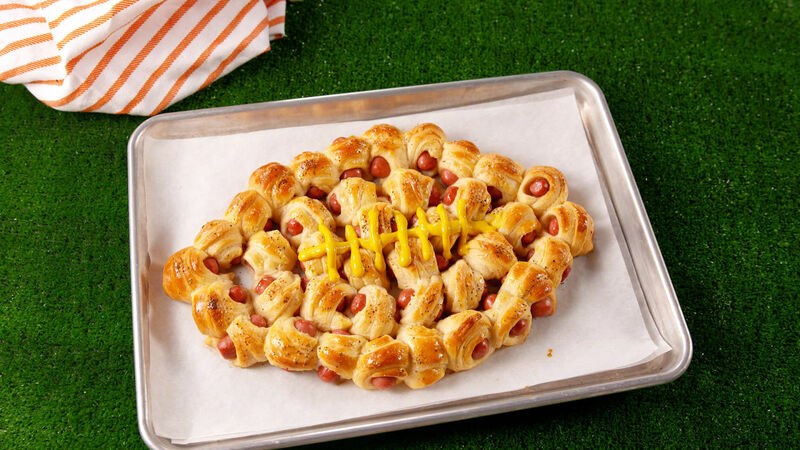 Cut up the hot dogs into bit sized pieces and wrap them in the crescent roll. If you place the pieces next to each other in the shape of a football, when it comes out of the oven it will be like a pull-apart appetizer. Yum and Fun! Grab a quart of beautiful strawberries, some white and dark chocolate, and a piping bag (or a plastic sandwich bag) and teach your children the joy of dipping strawberries. This recipe from MyMommyStyle has great tips for making this a kid-friendly adventure. Remember to leave the stems on and if you don’t want to mess with a piping bag, you can buy a pre-made white frosting tube anywhere they sell baking supplies – even some grocery stores. For a more budget friendly option, you can also make this recipe with grapes instead of strawberries. Just make sure the grapes are fully dry before dipping. This is a favorite for my kids. I love the way this fruit bowl design from Hosting and Toasting looks, it was a bit daunting to cut out the football helmet. I tried it on a couple of small watermelons and got the hang of it the second time. If you want to skip the fancy, cut just the top quarter out of the watermelon rind, just like you would for a basket, and use a marker to draw the laces of a football on the top. Wa-La! Watermelon football instead of watermelon helmet! But if you have the time, give the helmet a try because it is tots adorbs. Whatever recipe you try this playoff season, when you involve your children you get so much more than just a mess in your kitchen. You are teaching them skills they will value for a lifetime… things like self confidence, executive function, a growth mindset… oh, and those cooking skills too. And on top of it all? Time with you… the most precious gift of all. Thank you for having me on Family Fun Twin Cities today and be sure to share your photos on Instagram with the #familyfuntwincities and #kidscookingschool hashtags! We have ideas for other activities Beyond the Super Bowl: Visiting Minneapolis-St Paul as a Family. Use this cute printable to make the Super Bowl an interactive experience for your reading and non-reading kiddos. During the slow parts of the game, mix things up a bit and get the blood moving with a Football Fun Dance. Another fun game is a version of musical chairs. Fill a helmet (or bowl if you are desperate) with Super Bowl Party Favors. Play some music and pass the bowl around. When the music stops, whoever is holding the bowl can pick a prize. Remember this from you were a kid? Now is the perfect time to teach your kids the beautiful game of Finger Football. 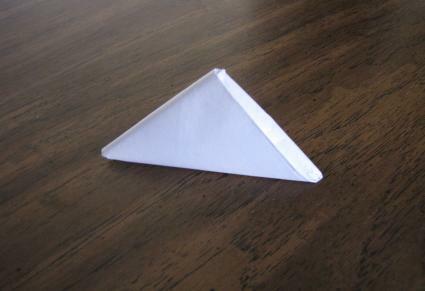 Though I don’t think I would call it origami. Want more indoor fun ideas? 45+ Fun Indoor Games for Kids of All Ages, Categorized.